Future Dates:- Sunday 30th September, Sunday 14th October, Sunday 28th October. Well the BIG SUNDAY is nearly here!! AT THE TWISTED WHEEL CLUB IN THE HEART OF MANCHESTER CITY CENTRE. 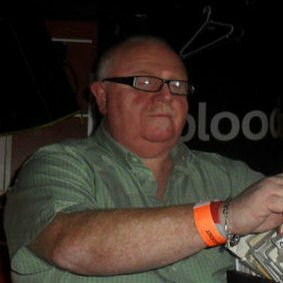 With our regular guest DJ the LEGENDARY " GINGER TAYLOR " on the decks in both rooms. THE WHITWORTH STREET WHEEL (THE SOUL YEARS) OPENED ITS DOORS ON 18th SEPTEMBER 1965. YES SO IT'S THE TWISTED WHEEL CLUBS 53rd ANNIVERSARY THIS YEAR!! 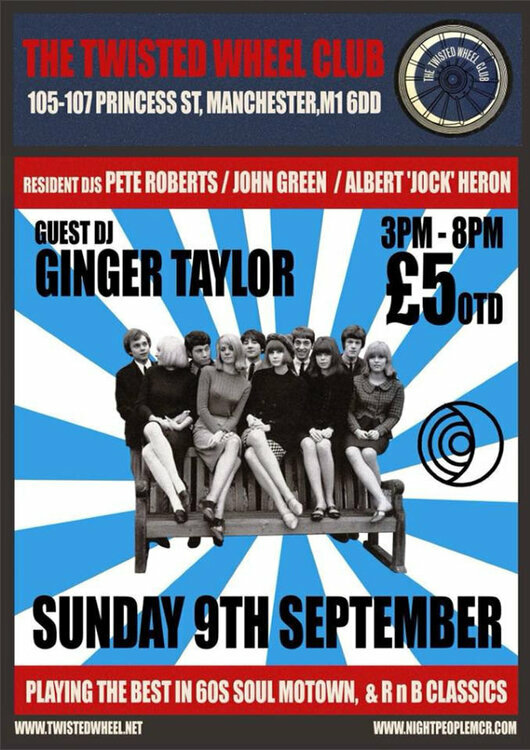 Looking forward to seeing you all on Sunday, in the Twisted Wheels Clubs Unique 60''s Basement. SO CAN I THANK YOU ALL FOR YOUR COMMENTS ON THE TWISTED WHEEL RADIO SHOW. There's Only One!! ..... And It's on this Sunday. 18 Continuous Years!! ... And We Do It Twice A Month!! ... So We Must Be Doing Something Right!! Ginger, is on his way, to the Club that he loves Dj'ing at, and he is really looking forward to seeing you all on Sunday. In this Unique 60's Soul Basement Club!! Not long to wait now!! ....... For the BEST £5 you will ever spend. SEE YOU ALL LATER IN THE ONE AND ONLY TWISTED WHEEL CLUB IN MANCHESTER! !